Prominent & Leading Exporter from Gurgaon, we offer medical razor, tweezer serrated, tweezer tooth, clamp forceps and clamp forceps wide. Disposable skin blade: we are reputed manufacturers and exporters of disposable skin blade which are used by most hospitals for skins. They exert less pressure on the skin and are perfectly disposable. These blades are also eco-friendly and biodegradable. 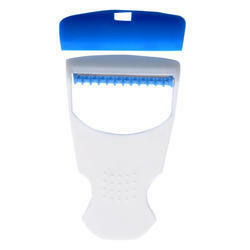 These disposable skin blade are provided with protect cap and they are 100% hygienic. These blades are manufactured from quality raw material using latest technology and they are also known for their high performance, durable nature and sturdy designs. Our customers ca avail these disposable skin blade in many sizes at affordable prices. are safe, hygienic, sterile, medical product that is scientifically designed to give you a clean and convenient patient prepping experience. These are general-purpose tweezers with serrated tip and being precise in design they are user-friendly & convenient to use. These serrated tweezers are also popularly known as Forceps, Tweezer, Dressing Forceps etc., by medical practitioners. We cater to bulk buyers like Surgical Instrument Suppliers & Manufacturers/ Hospitals / Doctors & others. Uze Once Tweezers with 1x2 Teeth (even known as toothed forceps / skin forceps) have interlocking teeth for a better grip on slippery / flimsy materials during any surgical incision procedure. These are sterile packed & are meant for single usage. Product's USP: Excellent finish and alignment of the toothed tip for a firm grip. Use Once Tweezers with 1x2 Teeth (even known as toothed forceps / skin forceps) have interlocking teeth for a better grip on slippery / flimsy materials during any surgical incision procedure. These are sterile packed & are meant for single usage. 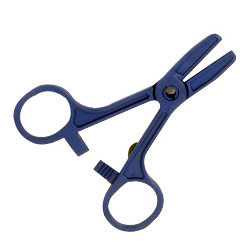 These UzeOnce Clamps Forceps are designed with multi-stage locks to hold dressings. Convenient to use & discard these are widely preferred by medical practitioners across different hospitals globally. Clamp forceps are also termed as Haemostatic Forceps, Hartman Forceps and Locking Forceps across the medical fraternity. Application: To grab and hold drapes / guaze etc. Product's USP: Good grip and sturdy locking. 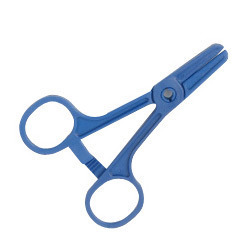 Popularly known as Locking Forceps, Haemostatic Forceps, Hartman Forceps etc., these forceps are devised with multi-stage locks theseclamp forceps grab and hold dressings, sponges & sterile pads efficiently and assure a precise surgical procedure to the surgeons & doctors. Popularly known as Locking Forceps, Haemostatic Forceps, Hartman Forceps etc., these forceps are devised with multi-stage locks these clamp forceps grab and hold dressings, sponges & sterile pads efficiently and assure a precise surgical procedure to the surgeons & doctors.